BRUSSELS (AP) — After tough all-night bargaining, European leaders appeared to salvage what had seemed to be a summit teetering toward failure by agreeing early Friday to funnel money directly to struggling banks, and in the longer term to form a tighter union. The agreements at a European Union summit in Brussels suggested Germany had yielded a bit on its insistence on forcing tough reforms in exchange for rescue money. That was a victory for Italy and Spain, who have argued they have done a lot to clean up their economies yet are facing rising borrowing costs. Markets breathed a huge sigh of relief on the news. Renewed concerns about Europe's debts have rattled investors worldwide on and off for over two years amid fears they could threaten the global economic recovery. Following big gains across Asia, European shares opened sharply higher, with Germany's DAX up 2.4 percent and the CAC-40 in France 2.6 percent higher. Stocks in Italy and Spain were doing particularly well, with Milan's FTSE MIB up 3.2 percent and Madrid's IBEX a hefty 4.1 percent higher. The euro was also heavily in demand, trading 1.1 percent higher at $1.2571. The importance of recapitalizing banks directly became evident when Spain asked for €100 billion for its shaky banks. Under current rules the bailout loan had to be made to the government, which would then lend it on to the banks. But having that debt on the government's books spooked investors, who began demanding higher interest rates for lending money to the government. The result was rates that would have been unsustainable in the long term. Lending the money directly to the banks would avoid putting that debt on the government's books. European Council President Herman Van Rompuy called it a "breakthrough that banks can be recapitalized directly." Analysts remain skeptical about whether the moves will fix Europe's debt crisis, especially as the amount of money available — some 500 billion — to help in the crisis firefighting is dwarfed by the amount of debt across the continent. Italy, alone, has outstanding debt of €2.4 billion. "While there may be some temporary sense of relief that the summit has not descended in to acrimonious discord, what has been thus far agreed is nothing more than sticking plaster," said Marc Ostwald, market strategist at Monument Securities. One aspect that may ease the short-term pressures at leaders is the agreement that those countries that were following budget rules could apply for bailouts that would not come with the stringent conditions that have accompanied previous EU bailouts — a recognition, according to Italian Premier Mario Monti, of the work such countries were already doing in reforming their budgets. Monti said Italy did not intend to apply for a bailout. Still, Van Rompuy said the bailout agreement was important. "We are opening the possibilities for countries that are well-behaving to make use of financial stability instruments, the EFSF and ESM, in order to reassure markets and get again some stability around some of the sovereign bonds of our member states," he said, referring to two bailout funds set up by the EU. 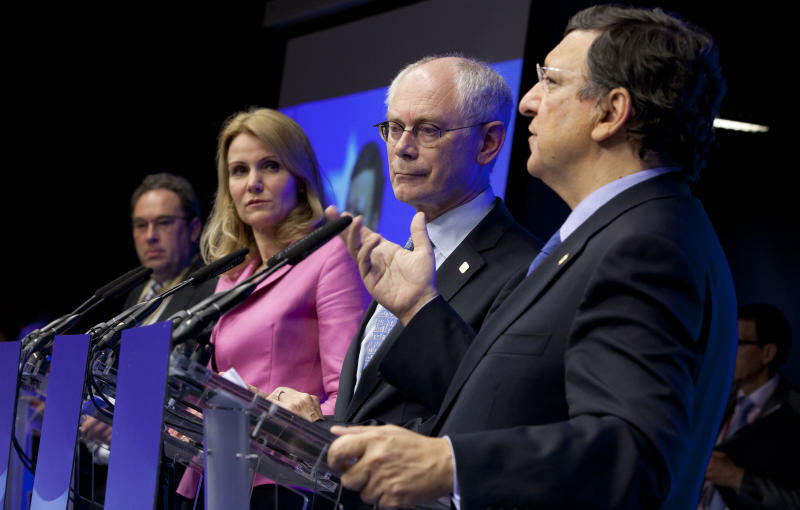 Van Rompuy said leaders of the 17-nation eurozone also agreed to a joint banking supervisory body. And he said the leaders of the full 27-member European Union, which includes non-euro countries such as Britain and Poland, agreed to a general long-term plan for a tighter budgetary and political union. 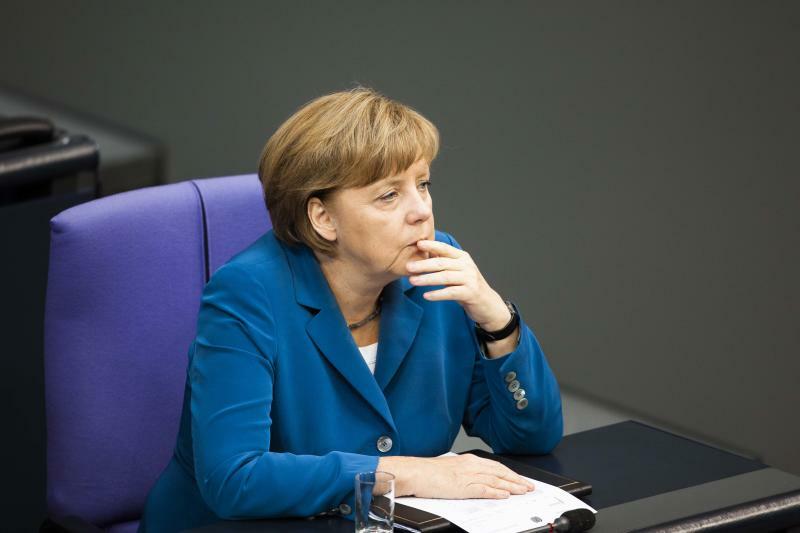 German Chancellor Angela Merkel said she was "very satisfied that we took good decisions on growth." She must defend the deal in front of German parliament later Friday. The leaders agreed to devote €120 billion in stimulus to encourage growth and create jobs, though half of it had been previously agreed, and it only includes €10 billion in actual new commitments. France had pushed for the growth package, arguing that austerity measures imposed to stem Europe's debt crisis were stifling growth and making it worse. The leaders agreed on "the four building blocks" of a tighter European Union — but said they wouldn't start pinning down details until a report in October. The building blocks were laid out in a sweeping document presented by Van Rompuy and colleagues earlier this week that included sharing debt in the form of jointly issued eurobonds. Van Rompuy said the report expected in October would be "a specific and time-bound roadmap for the achievement of a genuine economic and monetary union." 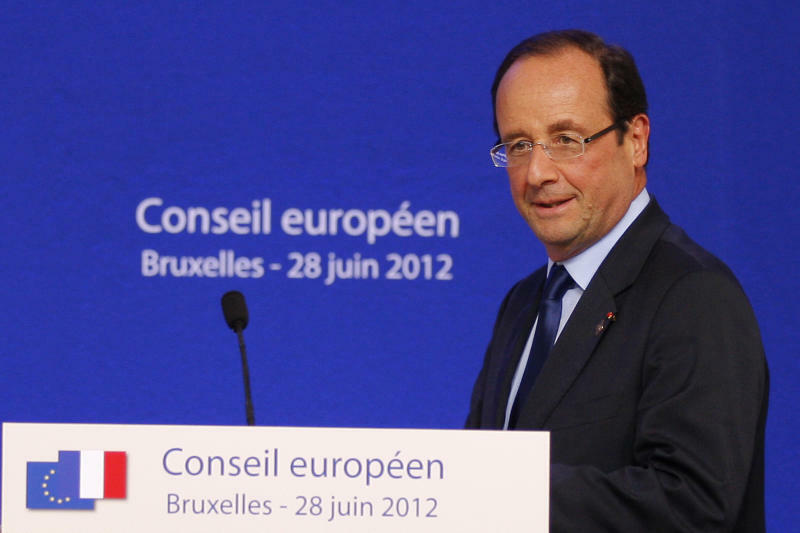 "The aim is to make the euro an irreversible project," he said. He did not say Friday, however, whether the general agreement on the tighter union included any commitment on eurobonds from Germany — which has firmly opposed sharing debt with more profligate countries such as Greece. Leaders were arriving again for more talks Friday morning before the summit wraps up by mid-afternoon.